Since 2012, the Marcus Fund for Families has continued to provide vital support to pediatric neurology patients and their families who seek care at Massachusetts General Hospital. The top priority of our Pediatric Neurology Faculty is ensuring that each patient who comes to Mass General receives the best possible care, and the Marcus Foundation allows us to help relieve the financial burden that families face when receiving treatment. Several of our families share with us that not having to worry about additional expenses associated with their visit has a huge positive impact during an otherwise difficult time. For those who received funding, it was often used to pay for parking during their six weeks of radiation treatment and meal tickets for patients and their families during inpatient and outpatient appointments. Additional flexible spending for the department also helps to support some patients outside the Mass General perimeter; assisting patients with accessibility at home or at school and with solutions that may ease their daily routine. We are excited about progress that is being made in understanding and manipulating the immune system’s response to brain tumors. Amazing and successful results using immunotherapy are being reported in patients with advanced cancer; however, these therapies have not yet translated into significantly better outcomes for patients with brain tumors. We are of the firm belief that success in treating brain tumors with immunotherapy is within reach; however, it will require more detailed understanding of how the immune system responds to brain tumors in their natural state, as well specifically targeted immune interventions – using combinations of immunotherapies, either simultaneously or in sequence. Over the past year, support from the Marcus Foundation has allowed us to continue studying combination immunotherapies in brain tumor models in mice. We recently published a study (https://www.ncbi.nlm.nih.gov/pubmed/29016879) showing that combining a personalized and subcutaneously delivered brain-tumor vaccine with simultaneous delivery of therapeutic antibodies first activates immune cells again the tumor and then further stimulates these cells and makes the brain tumor environment more fertile for immune-based killing. The two arms of therapy work via different mechanisms, have only modest impact as single therapies, and clearly synergize when given together. We have built upon these studies by adding a third arm, intended to specifically stimulate proliferation of a particular type of activated immune cell. Early results show dramatic impacts on the survival of these tumor-bearing mice – curing essentially all of them. This type of work serves as the foundation upon which clinical trials can be built, and seed funding from the Marcus Foundation and groups like it is essential to moving the needle against brain cancer. The Marcus Fund for Families provides vital support to pediatric neurology patients and their families at Massachusetts General Hospital. This funding provided by the Niziak family is making a meaningful difference in the lives of these children and families, providing access to funds to subsidize meals, parking and other associated costs. Many of these patients receive care over a prolonged period, placing a considerable financial burden on their families. Time away from home, other children, leave from work and the stress of illness weigh heavily on these families. The Marcus Fund for Families allows us to alleviate some of the small financial stressors that come with hospital stays. Several of our families share with us that not having to worry about small expenses that add up, such as parking, meals and other incidentals, helps make their stay more comfortable and has a huge impact during an otherwise difficult time. We have also had instances where the Marcus Fund for Families has allowed us to significantly impact our patients day-to-day lives by supporting custom communication solutions, accessibility modifications at home or educational solutions to ease their return to school. Having funds available to help our neediest families in this way is truly a blessing. The mission of the MGH Neurosurgery Brain Tumor Immunotherapy Laboratory is to design, explore, and translate novel approaches to manipulating host immunity against malignant brain tumors (malignant glioma). For the immune system to deter the progression of cancerous cells in the brain, we must train it to better recognize its targets and to overcome the evasive strategies that glioma cells have evolved in order to escape both immune detection and control. We, therefore, study the mechanisms by which brain tumors evade immunity and other treatment approaches. We believe strongly in the role of combination immunotherapy strategies that increase numbers of tumor-targeting lymphocytes as well as increase the conditions that permit their prolonged activation. In a phase I clinical study in patients undergoing surgery for recurrent glioblastoma (Grade IV astrocytoma), we have demonstrated that a patient’s own tumor cells can be harvested and used as material for a personalized cancer vaccine that positively impacts multiple arms of an antitumor immune response – both antibodies and T-lymphocytes. We have taken these data back into the preclinical setting and examined combining that vaccination with delivery of therapeutic antibodies that activate tumor-specific T lymphocytes, cells that otherwise may be suppressed by tumor-related factors. In animal models of brain cancer, we are seeing increased survival by combining vaccination with 2 or 3 of these antibodies, and our aim is to move these combination approaches into new clinical trials. In other lines of investigation, we are studying the impact of common mutations in lower-grade glial tumors have on the immune system and whether or not these tumors are, therefore, good targets for immunotherapy. In these experiments, we are collaborating with Dan Cahill, MD, PhD and Hiro Wakimoto, MD, PhD, both of whom have significant expertise in brain tumor molecular genetics and glioma modeling. We are also collaborating with Marcela Maus, MD, PhD in the design and evaluation of a chimeric antigen receptor (CAR) T lymphocyte that is engineered not only to specifically target and kill glioma cells but also to secrete immunostimulatory factors directly into the tumor microenvironment – hopefully increasing the both targeting efficacy and overcoming local immunosuppression. The Foundation recently provided a grant to the Massachusetts General Hospital (MGH). The proceeds were used in part to continue to fund the Marcus Fund for Families at MGH. The fund is used to help defray the cost to families with children undergoing treatment at MGH for cancer and other illnesses. The recent grant will also be used to support the research of Dr. Will Curry, the attending neurosurgeon at MGH. Dr. Curry is bringing new clinical trials forward which demonstrate that immunotherapy protocols (vaccines) can be used to supplement standard therapies in the treatment of brain tumors. Dr. Curry plans to attend this year's Marcus Foundation Golf Tournament and will provide an update on his research. The Foundation has once again provided a grant to the Marcus Fund for Families at the Massachusetts General Hospital (MGH). The fund was established to help defray the costs to families with children undergoing treatment at MGH for brain tumors and other neurological diseases. Moreover, we are also pleased to announce that we will be supporting the research of Dr. Will Curry at MGH. Dr. Curry is the attending neurosurgeon at MGH and is bringing new clinical trials forward which demonstrate that immunotherapy protocols (vaccines) can be used to supplement standard therapies in the treatment of brain tumors. Mark Niziak - selected for the one hundred 2015! We are delighted to inform you that Mark Niziak has been selected as a 2015 honoree of the one hundred. Thank you for your nomination! Join us on May 26 for the eighth annual the one hundred to celebrate our 2015 honorees! Learn about individual and corporate sponsorship opportunities. Thank you to our Visionary Partners: DIRECTV and The Kraft Group! Created and supported by the Massachusetts General Hospital Cancer Center, the one hundred is an awareness and fundraising initiative that celebrates hope in the cancer community. Each year, we honor 100 everyday amazing caregivers, researchers, philanthropists, advocates and volunteers from around the globe whose commitment to the fight against cancer inspires us all to take action. 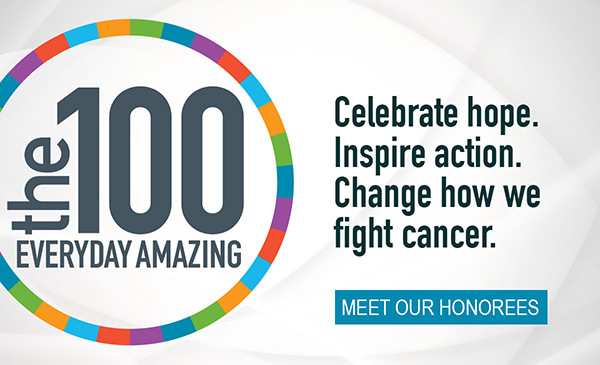 We’re announcing one #EverydayAmazing honoree each day for 100 days leading up to the May 26 gala. Follow the one hundredon social media and share the stories that inspire you! The One Hundred Fund, created and supported by Mass General Cancer Center, has recently posted Mark's story and acknowledged him as the philanthropist for 2015. Click here to read the article! Each year Massachusetts General Hospital honors One Hundred special people that have demonstrated extraordinary devotion in the fight against cancer. This year we are pleased to announce that Mark Niziak has been names a One Hundred Fund honoree. It couldn't come at a more significant time as this is the Foundation's 25th anniversary! Mark started the Marcus Niziak Childhood Brain Tumor Fund over 25 years ago to fight pediatric brain tumors of the sort that took Mark’s young son, Marcus, from his family. The Foundation has raised over a half million dollars and has devoted the funds to create a germ free room at Tufts and, most recently, to the Fund for Families at MGH. The Fund for Families is used to assist the loved ones of children that are being treated at MGH with expenses such as parking, meals, etc. as they stay with their children for the weeks of chemotherapy and proton beam radiation. Children from ages 13 months to 13 years benefit from this fund. Mark has inspired everyone around him to work hard for the eradication of childhood brain cancer. This year is his annual golf tournament's 25th year. Many, many golfers have attended all 24 tournaments. They do so for the comradery and fun, and because they believe in the cause. The Marcus Foundation recently provided a $15,000 donation to the Marcus Family Fund at the Massachusetts General Hospital. The Family Fund was created by the Marcus Foundation in honor of Dr. Elizabeth Dooling, a pediatric neurologist at MGH. Dr. Dooling was Marcus' primary physician throughout his two and one-half year battle and was someone who developed a very strong bond with him. The purpose of the fund is to help defray the day-to-day costs to families with children undergoing treatment for pediatric brain tumors and other neurological illnesses at MGH.